That's a wrap for The 45th in 2018. We greatly appreciate you reading us each week and hope you've benefited from the mix of US political news and our analysis every Wednesday. The year has begun in a state of transatlantic chaos as the US and UK governments offer a portent of more international instability and corrosion of systems of governance in 2019. 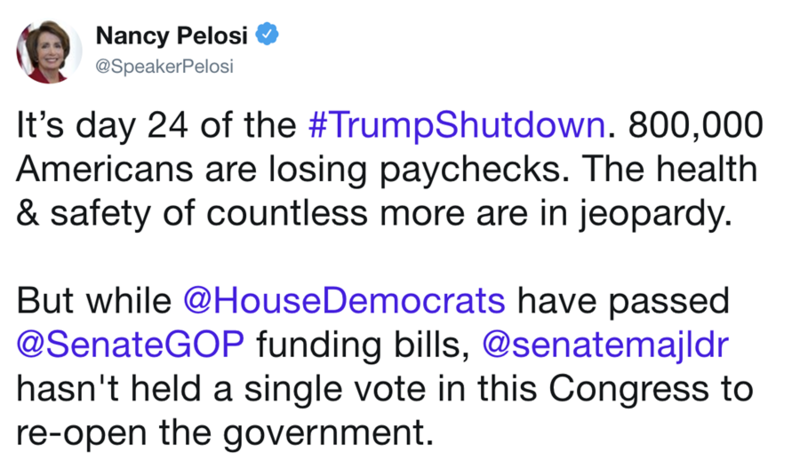 The US federal government's partial shutdown became the longest in American history on January 12 and is now in its 25th day. 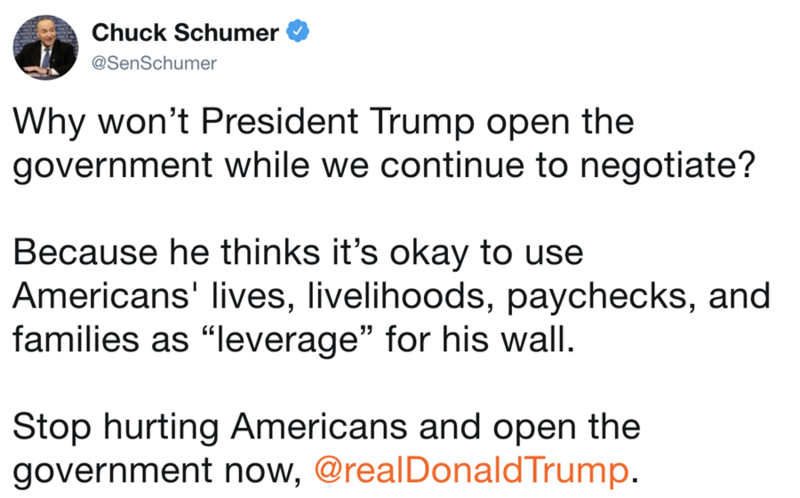 Neither the president nor Democrats indicated any willingness to budge in their stalemate over funding for a border wall with Mexico. Meanwhile, an estimated 800,000 US government workers continue to go unpaid until the impasse is resolved. Across the North Atlantic, the UK Parliament saw Prime Minister Theresa May's Brexit deal rejected by 230 votes overnight – the largest defeat for a sitting government in parliamentary history. May's government faces a no-confidence motion debate tomorrow, with expectations her leadership will survive, but with no clear direction of the future of Brexit negotiations. President Trump said he wanted to withdraw from NATO in 2018, according to senior administration officials who spoke to The New York Times. Trump reportedly told national security officials that he did not see the point of the military alliance, which he presented as a drain on the United States. The military alliance among the United States, Europe and Canada is credited with deterring Soviet and Russian aggression for 70 years. The Times story came just days after reports that former Trump campaign chairman Paul Manafort shared 2016 campaign polling with Russian contacts. READ MORE HERE. Former Trump lawyer Michael Cohen will testify before the House Oversight and Reform Committee next month about his work for the president. It will be his first public testimony since being charged with tax fraud and campaign finance violations in 2018. Democrats have urged Trump to stay silent ahead of the testimony after the president accused Cohen of lying and threatened to disclose damaging information about his father-in-law in an interview with Fox News. READ MORE HERE. Trump says he is insulted by reports that the FBI investigated whether he was a Russian agent in 2017. The inquiry was launched in the days after former FBI Director James Comey was fired by the president, according to The New York Times. Trump appeared at first to avoid answering whether he was a Russian agent when pressed by reporters, but later categorically denied the accusations. READ MORE HERE. Australia got a new US ambassador over the break, with Arthur Culvahouse, Jr. receiving confirmation from the US Senate in one of the last acts of the 115th Congress. The diplomatic role had been vacant since 2016 – a record period of absence. Visiting Fellow Bruce Wolpe spoke to the ABC about the appointment. READ MORE HERE. Republican congressman Steve King suffered a rare rebuke by the US House of Representatives Tuesday for making racist comments in an interview. The House voted 424-1 for the resolution of disapproval, which included a broad denunciation of white supremacist and white nationalist movements. GOP leaders also stripped King of his seats on three House committees. In an interview published last week, King rhetorically said “white nationalist, white supremacist, Western civilisation — how did that language become offensive?” READ MORE HERE. Ivanka Trump will help to appoint the new president of the World Bank. Former president Jim Yong Kim announced last week that he was stepping down. It had been speculated that Ivanka, the president's daughter and senior advisor, was in contention for the role which is traditionally appointed by the United States. The White House instead confirmed that she will assist Treasury Secretary Steven Mnuchin and the acting White House Chief of Staff Mick Mulvaney, in appointing a new head of the global institution. READ MORE HERE. I will not be bullied into doing anything I think is wrong by anybody, whether it be editorial boards or Congress or the president... I am going to do what I think is right. For a ratings-driven President Trump, the State of the Union address offers a uniquely large platform to showcase his vision. It is the only annual occasion that offers the president the chance to combine several important constitutional roles: chief of state, chief executive, chief diplomat, commander-in-chief and chief legislator. Along with the Super Bowl, Grammys and Oscars, the State of the Union is one of the highest-rating billings on the television calendar, particularly in the early years of a presidency. The address is typically one of the more optimistic and bipartisan speeches a president gives. As its purpose is ostensibly to provide an update on the progress of the presidency, it makes sense for it to take this dignified tone. It is not unprecedented, however, for a dour message to be delivered. Gerald Ford told the joint session in 1975 "I’ve got bad news, and I don’t expect much, if any, applause… the state of the union is not good". It was the blunt end of a proposal for economic reform. It is hard to envision the 45th president using such a large podium free from journalists' interjections to openly admit failures, even as a means to set the agenda. In his first State of the Union in 2018, Trump stuck to the teleprompter script and delivered a more or less stock-standard address. He observed a “new tide of optimism” sweeping the country and touted low unemployment figures and the strength of the economy as markers of his administration’s success. He extended “an open hand to work with members of both parties” and asked that Congress increase its spending on the military as well as infrastructure projects. He forecast a hard-line stance on North Korea and listed China and Russia as rivals. As optimistic and conciliatory a line is unlikely in 2019 – it will be the newly appointed Democratic House Majority Leader Nancy Pelosi – and not Paul Ryan – sitting over the president’s left shoulder as he speaks. If the president goes into the State of the Union with the government still partially shut down and without congressional funding for his promised border wall (or even having declared a national emergency on the issue) it is likely the speech will take the tone of an attack on the Democrats and the president’s perceived opponents for being unwilling to work with him. The oft-touted achievements such as job numbers, a new US-Mexico-Canada (USMCA) trade agreement, a tough stance on China, success against the Islamic State and tax reform will be listed as having occurred despite unfair opposition, and the president’s failures listed as wins waiting in the wings presently thwarted by those same opponents. This is the approach Trump took in his first address to the nation from the Oval Office in early 2019 where he pinned the government shutdown on "border-weak" Democrats. This kind of State of the Union address finds precedent in the Nixon era, where the beleaguered president famously declared in his 1974 address “one year of Watergate is enough”. On the policy side of the address, it is clear that immigration will continue to be a theme of the president’s agenda. This has strengthened through the 2018 midterm elections and into the New Year. 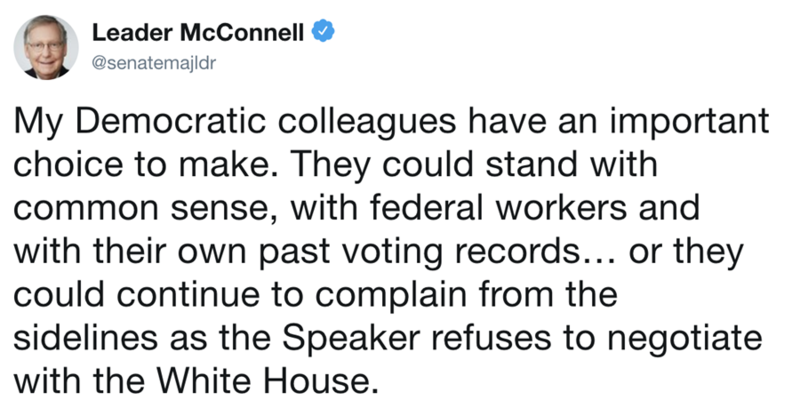 As the 2020 election draws nearer and Democrats start to shape-up for their primary contests, Trump will not miss this opportunity to campaign early and hard on a wedge issue. Read our full explainer on the State of the Union address, here. Wednesday, 16 January: No-confidence motion to be debated in the UK Parliament following the historic defeat of Prime Minister Theresa May's Brexit deal. Wednesday, 16 January: US Senate Judiciary Committee continues confirmation hearing for attorney general nominee William Barr. Monday, 21 January: Martin Luther King Jr Day in the United States. Tuesday, 22 January: Academy Award nominations announced.